Are Pit Bulls Friendly to Cats? Despite popular portrayals, pit bulls have gentle dispositions until trained otherwise and can be taught to be friendly to cats. 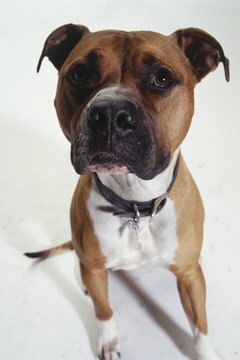 Pit bulls have reputations as violent dogs, although their loving and loyal dispositions can foster gentle dispositions. Typically portrayed as mortal enemies, cats and dogs -- even pit bulls -- can be taught to get along. Research shows this happens when they're introduced early. Pit bulls aren't one breed. The term refers to three related breeds: the Staffordshire bull terrier, the American Staffordshire terrier and the American pit bull terrier. Categorization and recognition varies by kennel club. Pit bulls have a bad reputation because of their exploitation in dog fights. While this speaks to the extent to which they can do harm, it has little to do with their natural dispositions. Statistical interpretation of attacks on humans varies and is at least partially political. According the the United Kennel Club, the American pit bull emerged during the 19th century as "a breed that embodied all of the virtues attributed to great warriors: strength, indomitable courage, and gentleness with loved ones." The key is for your dog to recognize your cat as a loved one. If you can choose the age and order of pet introduction, you've got a better chance of foster tolerance between dogs and cats, regardless of breed. Research from Tel Aviv University published in 2008 spells out the recipe for success: adopt the cat first, preferably one less than 6 months old, then introduce the dog, preferably less than a year old. Although many dogs and cats in the study interacted amicably, 25 percent were indifferent to each other, 10 percent were aggressive. In homes with successful pet integration, researchers noted that cats and dogs sometimes employed the opposite species' body language. Conflicting cues like an averted head -- aggression in a cat, submission in a dog -- were thus resolved. When adopting a pit bull, use a reputable breeder. A fighting-dog rescue is a noble option, but there's no telling what trauma and baggage might be inflicted on your cat. Choose a younger dog, as they have fewer ingrained habits and triggers. If possible, walk him by cat carriers to gauge his general response to cats. Shelters are sometimes stressful environments, so this may not reflect his normal disposition. Still, this gives you a good idea of his stress response. Ask about the animals' histories. Dogs that have lived with cats seem like a natural choice, but they can also bring aggressive habits and negative cat associations into a new home. Before introducing your pit bull to your cat, make sure the latter can safely observe and approach the former. Pick a couple rooms your cat is already familiar with and make sure she knows of higher vantage points the dog can't reach. In the early stages of introduction, you'll confine the dog to these rooms, so the cat can come and go without fear of pursuit. If you're introducing a cat to a home that already has a pit bull, secure him elsewhere, allow the cat to become familiar with the house, then confine the dog and proceed as above. As your pit bull and cat get to know each other, increase the duration and number of spaces where they interact. Use a leash and take your dog to rooms your cat frequents. In terms of discipline, tell the dog "no" or a basic posture command, such as "sit," if he barks at, chases or lunges at the cat. Don't punish misbehaving cats, as they tend to make more severe associations. 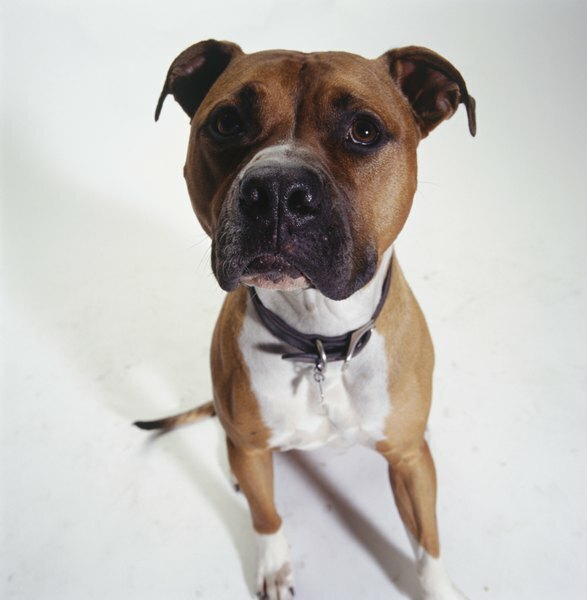 Pit bulls are quite trainable, thus clicker training and positive reinforcement via treats or toys is encouraged. Cats respond to lesser degree, but can by similarly plied. Continue building on positive experiences.